Angelina Estrada-Burney currently serves as a staff member for U.S. Senator Lisa Murkowski, senior Senator from Alaska. A large part of her duties revolve around assisting Alaskans from all walks of life and establishing effective dialogue with state leaders on a variety of issues. In this capacity, she serves as an important communications conduit between the Senator and the constituency of Alaska. Previously she served in the Anchorage and Fairbanks Offices of the Governor, worked on Capitol Hill for the Alaska Congressional Delegation, worked as a legislative aide in the Alaska State Legislature and as a Special Assistant in the Department of Commerce and Community Development. 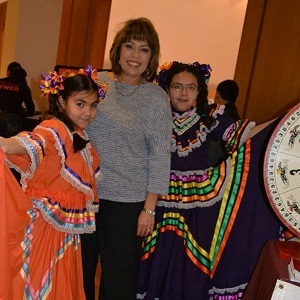 She is active in the Anchorage Hispanic community and is an inaugural Board of Director and Past President of the Hispanic Affairs Council of Alaska. She was chosen to represent Alaska at the 2002 and 2004 National Hispanic Leadership Summit in Washington DC. Ms. Estrada-Burney’s strong sense of community and love for Alaska is demonstrated by the organizations she supports. She is a past Board member of Alaskans for Drug Free Youth, Anchorage Hispanic Cultural Committee, Healing Racism in Anchorage, the Municipality’s Committee for the Promotion of Tolerance and Diversity, the School Districts Minority Education Committee and Big Brothers Big Sisters of Fairbanks and Anchorage.She has served as the Vice President of Public Relations for Bridge Builders of Anchorage and volunteered on the board development committee for Girl Scouts Susitna Council. She was recently featured in the award winning video “Anchorage is our Home” created for the non-profit Healing Racism in Anchorage as a tool to spotlight racism issues in our own community and was one of the Anchorage Centennial grant recipients for her collaboration on the Cultural Divers grant project highlighting the lives of immigrants that arrive in Anchorage the last 100 years. She has been recognized by both her peers and community leaders for her efforts to improve all Alaskan’s sense of unity through involvement and mutual respect. Past recognition includes her selection in 1997 to the inaugural class of “Civic Entrepreneurs” for the Alaska Humanities Forum’s Leadership Anchorage program and as a 1998 recipient of UAA’s “Extraordinary Women in Extraordinary Times” award.In 2002, she was an honored recipient of the Alaska Journal of Commerce’s prestigious Top 40 Under 40 award and was selected as the 2008 Anchorage Republican Woman of the Year. Angelina is a first generation American originally from Alamogordo, New Mexico.Her husband Erik retired from the U.S. Air Force after 21 years and they have chosen to make Anchorage their permanent home. Angelina, thanks for being with us. Again, a thousand interviews about hope from all over the world, so I’m really curious to hear more about you. Honestly, just what you’re doing and then we’ll get into more of your life and what you think about hope as we get started. So, tell me a little bit about you and then I’ll ask the first question. I arrived in Alaska in 1991. My parents were both born in Mexico, so I’m of Mexican descent. I was born in New Mexico. I am first generation American. I was raised there but what brought me to Alaska in 1991 was that I had married someone in the military and so we were there in New Mexico for three years before getting ordered to Alaska. Like many people in this day, we arrived through the military. We spend eight years here stationed at the local Air Force base here at Elmendorf and then we also retired out of Eielson Air Force base, I have lived not only in Anchorage, but also up in Fairbanks which is about 415 miles north of here. So, I have experienced both the south central part of Alaska as well as the interior part of Alaska. I’ve heard that Fairbanks is crazy cold and like way out there in the middle of nowhere. Is that the way really it is? It is crazy cold and I think what’s significant about the crazy cold is it’s crazy cold consistently for quite a long time. So, we have crazy cold here at times, but usually it’s maybe one or two days but the thing about Fairbanks is how long the crazy cold can last. You can have up to a week to 10 days of 50 below zero temperatures and that’s not unusual. Wow that’s crazy. Wow. That didn’t even compute for me. Okay, so – you obviously needed some hope in the cold weather essentially. Question 1: What is your definition or your feelings, beliefs, whatever, what do you think defines hope for you? I think personally, hope for me is just something to look forward to as I start each day in a positive way. So, it’s something to look forward to when something good is going to happen, whether that good is created by me or whether it comes my way. Hope is this attitude that I keep with me and whether that’s a piece that you find within yourself, a piece that you find in your spirituality or just a piece that you find with your family and friends, it brings me hope because the future is going to be positive. Good things happen, bad things happen, but because I’m secure in all of that other then I continue to wake up the next morning with that continued hope that there are positive things coming my way. That’s a great answer. Thanks. I love hearing these answers. It’s so real, so honest, so thank you. Question 2: Who’s shared the most hope with you in your life? Who has really given a lot to you that’s given you any hope that you have today or at least helped you in that path? I will have to say that that’s the combination of my parents most especially my father. My father grew up pretty poor. In New Mexico, we don’t have the diversity that we have up here in Alaska. You’re almost always either Mexican or African-American white, but not very much else outside of that. So, are you from Mexico or just your parents are from Mexico? Give me a little background there. Both my parents were born in Mexico on the border town of Juarez which is the border town of El Paso, Texas. So, we’re very, very close but my father came over to the US when he was five, so he grew up in the US and then my mother did not grow up in the US. She grew up in Mexico and didn’t come over to the US until she was 25 when she met and married my father. So, two very different experiences for them. My father grew up poor in New Mexico kind of up in the mountains and had a really difficult life because of the prejudice that the family experienced. Growing up, I heard stories that he shared with me about the prejudice that was shown to his family from the rich cattle baron’s that were there in the New Mexico area where they were from in a place called Alamogordo. It was a place where banks didn’t lend money to Mexicans because of the extreme prejudice. It was a place where they were ostracized. The white kids didn’t want to play with the Mexicans because Mexican kids were just trash and so they were not very welcome in school and because my father came from a family where it was a single mother trying to raise four children on her own with very little resources – just like any other time in history, kids were ostracized because they didn’t have the good clothes or just the extra money. Based on what he experienced, I think the reason that I feel hope from him is because he didn’t want that same life for his children. He, like very many other immigrants and people that were in the US for the first time, worked very very hard so that my sister and I never experienced what he experienced. I think hope for me also goes back to the security that you are loved. I recognize that I am so blessed in that because there are so many people who don’t have that. I don’t think I’ve had a day in my life, and I still have both my parents, that I am not secure in the fact that I am deeply, deeply loved and that’s with them. Then, I married my husband that I’ve been married to for 27 years now and he has done the same for me. I recognize that that security, that peace that I carry with me wherever I go, that is such a blessing because there are so many other people who don’t have that, who are not waking up in the morning in that absolute secure place that I’m deeply, deeply loved. If there is ever anything that I need support in, I have that. As an extension, you move up to a state like Alaska and you move up here with no family and so you have to find extensions of your family. I don’t have a father or a mom nearby, they’re 5000 miles away, so your friends become your extension of your family. For 22 years now, my friends have been my family and I am secure that if something ever happens in any way, shape or form, there are 10 people on my list that I can call – again a blessing because I recognize and I am grateful because so many people don’t have that. Wow. That’s a great story of relationships. It really is. You know, on the interviews that we are doing, unfortunately, a lot of the stories don’t have strong relationships and it’s really great to hear somebody who has that anchor with very few fractures even. It’s unusual but it means it can be done and if we get ahead of it in our own lives, with the relationships we can invest in – maybe not to find this from our past, but we got new day right now so let’s get going. Great point. Thank you. Question 3: Tell me more of your story. What’s back there? What’s been going on your life? Take us back and paint a picture about what was going on when there was something that was causing you to lose a lot of hope? What’s been really hard? You seem like a really hopeful person while I talk to you. Lots of smiles and lots of energy. It’s just giving me hope, but life is not perfect for anybody, so what do you have back there that we can learn from? That’s a true statement – life is not perfect for everybody. I am very hopeful person and I’m a positive person, but probably my biggest struggle was in my late 20s and early 30s and it was just the basic fact that my husband and I struggled and we could not have children. I got married at a very young age, right after high school, so I’m a young bride, 19 years old. I think that when you’re growing up and you’re a teenager you’re spending so much time worrying about just finding that perfect person and then you do and it never crosses your mind that something that you take for granted like having a child might not happen. And so, the fact that I come from a Hispanic family probably doesn’t help either because there is a tremendous amount of pressure, typically, culturally having a big family because family is so important and a central part of the Hispanic-Latin culture. Not being able to have a child is quite shocking on a family. We took for granted that immediately after we got married we’d have a child and so then a year passes and then two years passes and then three years passes and then you don’t have one. So then you start to do what many people do and medically take all the tests, look into what the problems are. In my particular case, there was a never reason why but you struggle with that with just the basic fact that you are not going to have a child. That is hard enough. I’ll also emphasize it was really quite difficult for a woman – that’s how you connect so often with other women. There is a lot of baby talk and there is a lot of planning your family and there was a lot of play dates and all of those things and so for a long time I don’t fit. I don’t fit because all of the people that are my same age, all now in my 20s are having their first babies, having their second babies, talking about play dates, talking about college and I’m not there. I don’t fit because I don’t have anything to share in the conversations and frankly after a while, the many questions and assumptions that are made about you, about whether you chose not to have children or whether you didn’t have children and why, it just gets to be a conversation that you just don’t want to answer the questions anymore. And so, the other side of that, as you mentioned, I am a very hopeful person and I am very blessed in the family that I have so there is a lot of guilt that comes with that as well because you are married to a wonderful man who would have been an amazing father. Because he chose me, I have robbed him of that. That is a really difficult thing to live with. Then, you also have a mom and dad who are amazing parents, amazing parents and who would have been amazing grandparents, but they won’t be because I can’t give them grandchildren. That puts them into that same I don’t fit category because now they’re in their 60s and 70s and everyone’s passing around pictures of the grandbabies and passing around the pictures of some of them now, great grandbabies and they’ll never have that. That is a struggle that I had to really work through because the guilt part of that weighs very heavily on you. Do I release my husband so he can go find someone else so that he can be a father? I’m catholic, I have a very deep faith and you go to church and you ask God to give you a child, the gift of a child and years go by and it doesn’t happen. So you ask, what did I do wrong? Why me? You go through all of that. It’s just an emotional roller coaster. I have to wake up in the morning and have to remind myself that I do have all of these other blessings and what’s going to be important for me is to not wallow in my sorrow and I can do great things and impact other lives even if they’re not my own children. It’s tough, it’s really tough because we’re getting older now and my husband, I think, really struggles with the fact that we don’t have a child. Now it’s the unknown, as you get older, there’s nobody to take care of us. When people are talking about as I get older, I’m not going to have someone to go move in with and I’m not going to have someone to go sit on the porch with, with a bundle of grandkids on my lap. That is something that I will never experience and I’ll never experience with my husband the gift of those children. So, we have to plan our lives completely differently than someone that does. It’s an everyday struggle because the guilt sometimes can really get to you. For me, just like Shirley says, you find joy and hope in your day to day. In songs, relationships and in family and you just bless and release that sorrow and I just have to move past it. It’s my sorrow and I know I’m certainly not the only one, there are so many others, but I just have to get through that. I think my late 20s and 30s were probably my most challenging and certainly because that’s when most women – yeah. I think after you pass your mid-40s, I think in the back of your head you always had that just maybe, just maybe the miracle will come and you just might find out that you’re pregnant, just out of the blue. But, once you pass your mid-40s, the options are no longer there – physically you just can’t do it. It’s a struggle, everyone has their story, it’s mine, I own it, but I choose not to let it own me. I’ve never heard that simply from somebody who wanted to be a mom. Many of us know somebody, maybe a bunch of people who couldn’t have kids, but so many people do. It’s just, you don’t keep it in the forefront of your mind because it’s not your everyday norm, you know? That issue along with so many others that you don’t know if somebody in the next cubicle over or riding in the subway with you or your next door neighbor, you don’t know what’s going on in their life. That’s pretty quiet. You don’t just go blabbing that stuff around. Those are real deep issues and I’m impressed with your bravery and I’m impressed at what you said there at the end that it’s your issue and you own it. I know you don’t mean your fault, but it’s your issue and you own it in the sense that it’s your story. It’s what you’re working with and I don’t know how often you share that story, but I promise you there are a bunch of people who are going to be thankful that you shared your story today. You are so good at sharing that. I know it’s hard, but I’m sure you have comforted a lot of people who have already gone before you, but you got to be ready to share when it’s time. You know when it’s time and you know when it’s not. Thank you. As long as you got a phenomenal family around you who I’m sure your mom and dad and perfect husband are not all perfect people and haven’t had perfect lives either, they probably have their own stuff that you get to support them in. Obviously, you got a heart for it because you know what it’s like to be supported. Sweet. Thank you. Question 4: What are you doing today to share hope with others or growing in hope yourself? Give us some real life examples that you’re working through that you’re doing for you or somebody else just in the line of hope. One of the things that I really enjoy about Anchorage and one of the reasons that I got involved in the project with Vivian and Shirley Mae is I love the diversity of Anchorage. As I mentioned before, in New Mexico, there are some diversity, but pretty limited and especially where I was from in the Alamogordo where you’re right to the Mexican border. So really, the overwhelming group of people that you’ll interact with are people of your own cultural background which is Hispanic. I came to Anchorage and such a unique place because it took me coming to Alaska to have the opportunity to meet people from all over the world and there are 27 Spanish-speaking countries that are represented here in Anchorage which is amazing. I came to Alaska to actually meet people from other Latin-American countries which is so very cool. Then there is the great diversity from all over. So early on when I moved here, I was working for a bank and one of the first things that they were doing was outreach to the Hispanic community. I ended up doing a lot of volunteering for the bank at the time. That kind of led me to just community volunteering as a whole and I really enjoy that. So, I guess I’m what a lot of people would call a joiner. I have sat on a lot of boards and a lot of commissions that I have volunteered for a tremendous amount of events and organizations. I’ve got one of those magnets in the kitchen that says “Stop me before I volunteer again”. These two would be able to relate. I find joy in that and I won’t be able to do something for my own family, but my community is my family now so if I can leave a positive stamp on my community – the other thing outside of just my nonprofit volunteer work, I’m pretty passionate about civic engagement and so I got involved in politics in ’97 and so I’ve run quite a few political campaigns and I’ve served and advised on political campaigns and again, it’s because I care about this community and so I want people to engage and I support people who I think have the same vision for this community like I do. I enjoy it because again, it’s people working together to just make this a better place to live. So, I would say that besides the family time and the service to your church and the service to your friends and family, the service to your community is very important. That makes me hopeful. I hope that 20 years from now or 40 years from now, I can look back and say my impact, my legacy was that I left this place a better place in what I was involved in. Now, I think you’re working for a senator here in Alaska, right? Who’s the senator? I do. It’s our senior senator, her name is US Senator Lisa Murkowski. She is the chair of the energy and natural resources committee and she’s been a US Senator since 2002. I would say you are very involved in politics. Obviously, if you’re working for her, she’s got to be a great person. The two you of you are able and your whole team, obviously it’s a large team, you are able to bring a lot of hope. That’s such a practical way politics, it’s such a practical way. I’m not very political, never volunteered for anything political, maybe I should sometimes. Sometimes I don’t quite understand how it works, so I think I should. I vote, I do vote, but it’s hard to figure it all out. It’s a practical way to really get in the community and affect real change. I mean she’s getting to really bring change to the state. That’s incredible and you’re getting to bring so much change to your community and so much hope. Something that comes up a lot is the sharing of hope in the community. That comes up all the time in these conversations and it’s so obvious that if we don’t share hope then it grows stagnant. It’s like a sponge that’s on a kitchen counter or in a dark spot in a shower corner, you know how it gets, they just get mildew and nasty and they may have a lot of water which we’ll use in our analogy that that may be the hope that it has. If it’s not giving that hope back out and getting recycled constantly, then it gets to be a really nasty sponge or a nasty old rag. You are sharing so much hope and recycling hope in a way and every time you do it, it spreads and it’s really cool. Thanks. Question 5: How can you teach me and the people who are listening with me, so many friends that I have here with the I Share Hope project, how can we learn to grow in hope personally or to share hope with somebody else? What are the simple steps? I think something that I try and do that I think people remember is the simple gift of a smile. A smile brings so much and you just have to force yourself to smile if it’s not something that’s comfortable for you. I think that the more you try it and get out of that frown that you have on your face, it seem so simplistic, but just smile. I really think it makes a huge difference when you wake up in the morning and just smile and give yourself that gift. When you do that with the people that you surround yourself with, that’s a gift as well. You think about all those quotes, Maya Angelou and many others about how they won’t remember anything else other than the way that you made them feel. Like surely, you say thank you when it’s warranted and you reach out maybe just when they least expect it just to check on them and just let people know that you’re thinking of them and those simple, small kindness go a long, long way. I’ve learned at this table tonight things about my friends that I would have not known and would like to have known so I could have reached out and said I am thinking about you today. I’m here for you if you need me. You may not know what’s going on in your neighbor’s life or your best friend’s life or your acquaintance’s life, so a little card in the mail, a little phone call, a little text these days just to say “I’m thinking of you” and “I’m here for you”. Very simple and a great Maya Angelou quote. I wish I could recite the quote right now, but so smiling is so important. That’s not the Maya Angelou part, but that’s important because it makes that physical change and it makes an emotional change. I don’t know how it works and yes, you can fake a smile , you know, if you’re just crying your eyes out someday and somebody walks in the office that’s not so close to you – it’s not the same smile. We’re talking make yourself really smile and then doing that with somebody else. That just really works. If you need to be tickled or you need to watch a funny sitcom or read the funny papers or just watch kids that you know in the neighborhood playing and doing something completely stupid or funny or reading in the newspaper about people who do stuff completely stupid in your community. Laugh, it’s okay. You’re not making fun of them, just laugh because you need to. In that Maya Angelou part with people really won’t remember much about you other than how you make them feel. Angelina’s favorite song when you’re just rocking down the street, you need to feel better, what are you going to pop in? What’s going to be in your ear buds or on your stereo? Anything by Black Eyed Peas. Got to love that. If you could live anywhere besides Anchorage, Alaska where would it be? Anywhere outside of Anchorage? Colorado. What part? Mountains or Denver? Yes. I’m with you there. That’s a great place.